I thought wolf spiders were brown? I'm so glad you posted this. I found a spider in my room walking back and forth along the wall near the ceiling. And it was doing that for hours. This bugger was fast too. I finally got freaked out when it hit the picture on my wall and dropped to the carpet (like any other 15 year old girl would) and left my room. I immediately thought it was a wolf spider. I was unsure though. So thank you for posting this. I'm from brownstown Michigan and I have a newly built house so I don't understand why I have daddy long legs (basement and outside) jumping spiders (kitchen only) and wolf spiders (in my room only--top floor and outside) I thought spiders are mainly in older houses. Do you think that the reason why I have these spiders in my house and around it (did I mention grass spiders) is because My subdivision was built off of an area where they cut down woods? And lastly, my subdivision is still surrounded by woods. 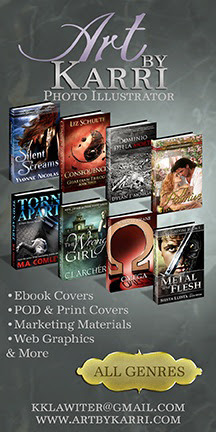 Hi Jordie :o) Glad my site was of a help. A little advice.... Mosquitos and other insects are drawn to lights. 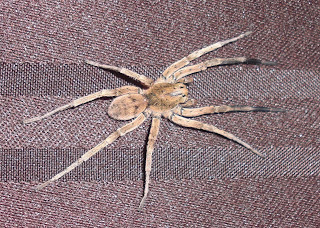 (Porch lights, lit up windows, etc...) The spiders are attracted to those insects as a food source. So leaving porch lights on or windows blinds open at night can bring a lot of spiders to the house. You can also buy a spider repelent at Home Depot in a gallon jug with a spray nozzle and a hose. Spraying around the windows outside as well as doors every couple months can really help keep them from coming inside. Your Wolf Spider was likely a male looking for a mate. They roam around looking for mates this time of the year and sometimes are drawn to the warmer indoors during the cooler nights. I have, what I believe to be a wolf spider living in a bucket in my garage. It looks like the one in the picture above and is about the size of a silver dollar. How big do they actually get? They are fairly large spiders. Some grow over an inch in size. I once caught one that the body alone was the size of a quarter. I am sure it was not the biggest either. I've only ever seen wolf spiders grow to about the size of a quarter here in MI, but down in the Smokies, I've seen them as big as silver dollars. Course everything is bigger in the Smokies, but seeing how the environments are similar I suppose the could get as big here. I've been getting very large greyish brown spiders with wto humps on the top front of the abdomine. they are very agressive and will actual charge you if provoked. any ideas what these are? also they are about 3/4s of an inch from front to back not counting legs. the legs span is about two inches in dia. and rather large fangs. i live in kingsley mi. any help id these would be nice. I am sorry, but I just cant say what it would be from the description. If you could get a decent pic of it and email it to me I might be able to help you. I think i just found a big one...about half the size of my iPhone 4. I'm technically flat rock but on the New Boston border. I live in Cliton Twp., Michigan North East of Detroit. I have encountered nermous Wolf Spiders at Work. They are huge. Scares the heck out of all of us. They have gotten so big, they are at least 1/2 dollar in size including the legs and that was not the largest. We had baby spiders cralling all over our desks. We had to bomb the building. Please dont take this wrong, but you either have a very small yo-yo, or you have tarantulas. The body of a Wolf Spider does not get much bigger than the size of a quarter. Maybe a half dollar. I have never heard of a spider actually chasing anyone around a room either. 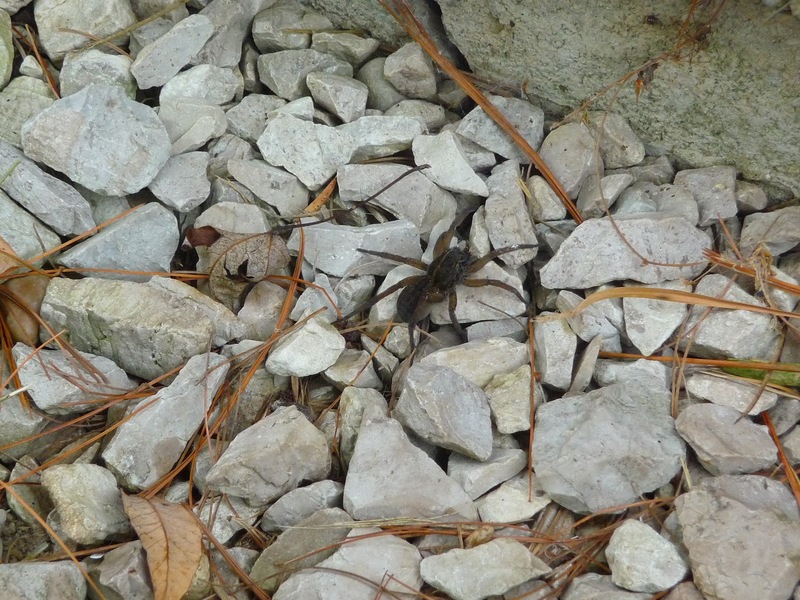 The spider in the picture is definitely a Wolf Spider. You will have to send me a pic of the spiders you get, and please, try and get a pic that shows detail as well as something else in the pic so I can get a size comparison. I saw one of those, too. It was living in a web in a tree by my old apartment building... then I saw one in my neighbor's kitchen. She had a young daughter who came screaming across the street that a spider was trying to kill her. I went to check it out. It was HUGE and black and furry. It's eyes were easily visible. It was staring at us from across the kitchen. When we moved, even slightly, the spider shifted its body to continue looking at us - like it was stalking or hunting. I've yet to find a picture of it online, or anywhere else. I'm starting to think I'll never know what type of spider it was. We threw a towel at the one in the kitchen and ran like a bat out of #$!! When we went back, the towel was quite a ways from where it landed and the spider was gone. When her mother came home we went and bought spider spray or something like that from Home Depot. Never saw the thing again, but it was SCARY and I still look for it whenever I'm on spider sites. Please do not look at just the main image as these spiders can come in different patterns and shades of colors. Scan through them and you may just find your spider. I have pics of all of those spiders that have been sent to me to identify, but unfortunately I have been working a ton of hours and have not had time to add those images. Hopefully soon. If at all possible, I would always prefer a good clear picture of a spider being sent to me. Outside of that, I can only hope there is something in the description that really gives it away. My son works on a paintball farm and just seen a spider that he said looked like a tarantula. He said it was big, hairy and stood up like it wanted to lung at him. Hey I was wondering how large young/baby wolf spiders are.. My family is seeing them or another quarter sized spider all over our house. Two across the living room floor in less than an hour..
A mother Wolf Spider will carry hundreds of babies on her abdomen for a time until they are able to fend for themselves. Sometimes they are disturbed and will flee. 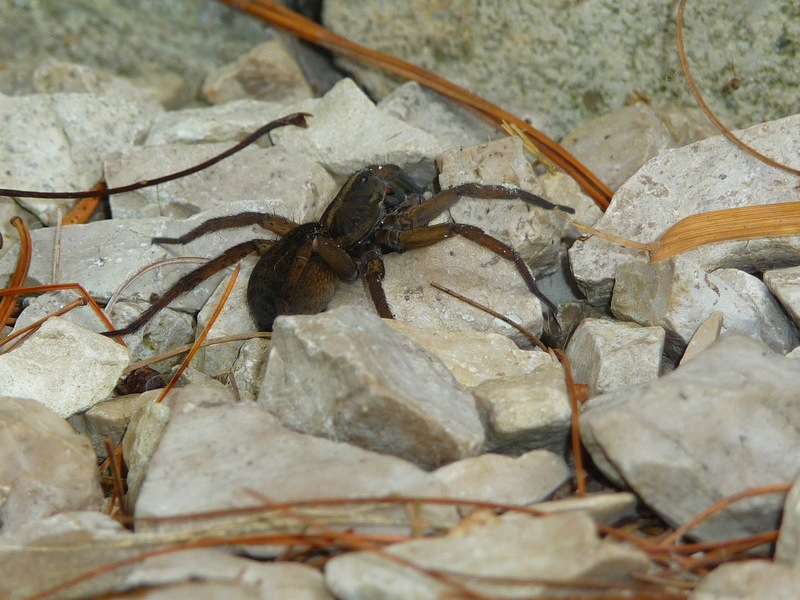 If a Wolf Spiders young have spread out in your home, you might have to consider getting your place exterminated. What is the gestation on the eggs for a wolf spider? And is a wolf spider the same thing as a wood spider? Are wolf spiders poisonous? 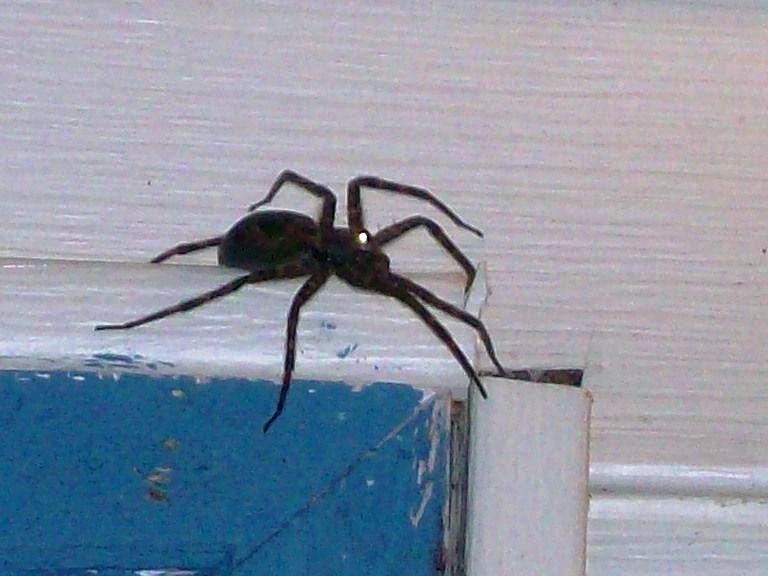 I have lived all over Michigan in city and rural areas, where lights are on all night and in areas on the Great Lakes and Detroit River and also inland waterways with docks and boathouses over water, etc,etc, and I have NEVER seen anything like what seems to be reported commonly on this site as to HUGE effing spiders. Even a Wolf spider as large as a quarter is common but a wolf spider with a body the size of a quarter? Hard to believe. I have seen spider eyes glowing from the beam of a high powered L.E.D. flashlights in my home or even by shining into the woods as if shining for deer. I think you people have an enormous imagination. 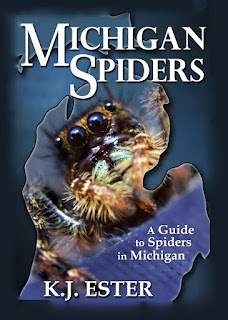 No official guide to Michigan spiders lists anything as large in Michigan either, outside of some fishing or water related spiders, but that is with legs included and not just body size. I do not have a picture because unfortunately I did not have a camera with me that day.... but this is the honest to god truth. A few years back around 06--- I was riding together on a four wheeler with a police officer (him driving and me sitting behind ) in Hawks, Mi and as we rode together down a trail in the deep woods...probably less than 40 feet up ahead....something was crossing the trail. The police officer noticed it first and said to me "WHAT IS THAT up there, A CHIPMUNK?" As we got closer we saw what it was....it was a gigantic spider. I have no clue what in the hell it was and I wish to god I had a camera.....this thing was bigger than any normal spider I have ever seen in my life. I got off the 4 wheeler and the police officer did not !!! I followed it as it made it's way to a ditch that was full of crunchy fall leaves. The spider made its way down into those leaves and I could HEAR it walking through them.. Let me remind you again that the police officer would NOT get off the 4 wheeler ....And as he sat there in amazement and horror---(he was as freaked out as me) he stated "there is no doubt in my mind that that spider could crawl up a tree and eat a bird right out of it's nest" I tried and still do try to search the internet to find a spider that looked like that one and haven't done so. I am only 5 ' 3" and my hand measures (from finger tips to wrist) 6 inches by 4 across (with my fingers squeezed together straight) And I am telling you sir this spider was as big as my hand counting the legs. I swore to god that day that I would NEVER ever ever sleep in a tent again in my life. There are definitely bigger spiders out there than we are aware of....just because YOU have not seen one does not mean they don't exist. This police officer who witnessed this spider along with me is from Chesterfield Mi and his Name is Chris Delor....he saw it and was in as much disbelief as me !!!! 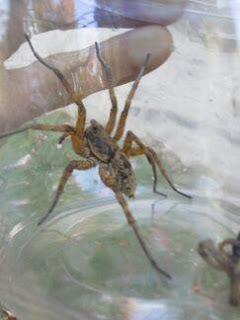 Since that day I have made sure I carry my camera with me pretty much all the time.... and I have captured some big wolf spiders but never got a picture of one that size YET.... , My name is Melanie West , I am from Kalkaska MI and I AM NOT exaggerating. I've seen a spider like this as well. I grew up in Clarkston, Michigan. We broke ground in deep woods north of Pine Knob to build our home. The first yeat we lived in the house we had these HUGE black furry spiders. My mom thought one was a large mouse. We caught it in a pint mason jar and it spanned the bottom easy. I've been searching for years to find out what it was. 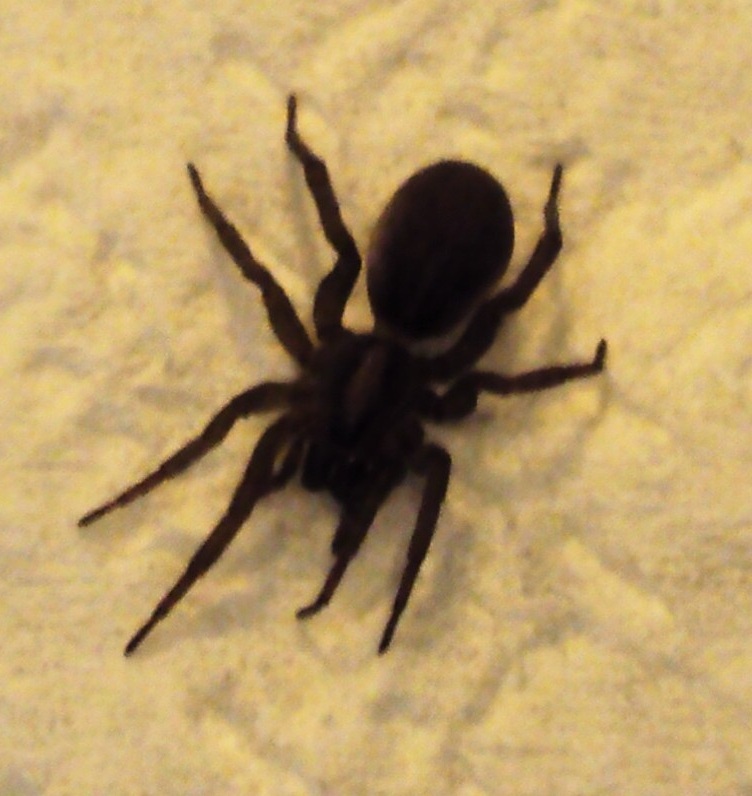 It looked like the dark wolf spider above with the real rounded backend but it was a LOT larger. Anonymous (I wish people would leave some kind of name) I have spent some time to update this page with several more pics that have been sent in to me. You will notice there are a few that shows how bog the spiders are. Just because you have never seen something, it does not mean it is not real. 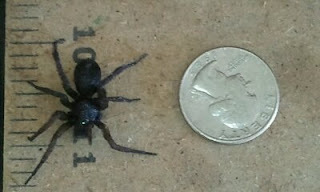 Hey, i just emailed you this picture of this nasty spider.. thank gosh it was dead when i found it.. but i just had a baby who had to get heart surgery and i dont want her to get bite by anything.. im not sure its even a wolf spider ): so if you can please get back to me asap, thanks! Hello, Ive seen a spider a couple times in my basement the last few days. The first time I saw it I was lifting up laundry and I saw a spider who's body was about the size of a half dollar. It was black with fat hairy legs, and within about 3 seconds it was across to the other side of the basement. I'm not sure if it was a wolf spider, a jumping spider, or a tarantula. Also, it dosent crawl, it seems to jump from place to place. It dosent seem to like it when I turn the light haha. It scrambles. When I was little my cousins and I caught a spider in bucket (smaller version of a 5 gallon bucket) maybe a 2 1/2 gallon, not sure. It's legs touched edge to edge of that bucket and it had quite a leap! This was in Belleville, MI in the 80's. We thought it was a wolf spider but maybe we caught something not originally from the area, it had to be 5" or more from leg to leg, it was so scary! I have never seen another spider like it since. Heebee jeebees!!! I live in Belleville, and just had a large brown spider on my bathroom floor. This thing was huge. It was just sitting there. I watched it for a few minutes, but I wasn't close enough to see any markings. As I moved closer, it started to run and before I could get it, it ran into the vent. I'm a hunter and see spiders all the time. I thought maybe a wolf spider, but this thing was at least 2-3 inchs around, including it's legs. It was dark brown, with long thin legs. Not sure what kind it was, can wolf spiders get this big? Aaron C - it sounds to me like a cave spider..they have fronts like spiders and back legs like a cricket and jump as high as 6 inches into the air...I have seen them in East Lake Michigan and in the basement level of a building in Grand Rapids Michigan. They like it dark and musty (like a bathroom). They overran the office building in no time and had to be exterminated. Grand Rapids, -- I replied through an email. In short, I dont know about Wolf SPiders jumping on water. I know they can walk on it, at least some can, but jump? To my knowledge, Wolf Spiders usually dont jump much. Belleville -- It very well could have been a Wolf Spider. Some species of the Wolf Spider can reach that 2 to 3 inch size. 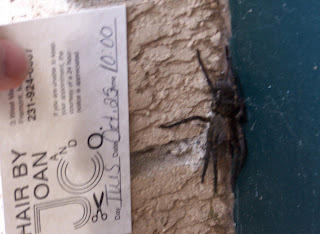 Larger, in the realm of 4", I would then say look at Fishing Spiders. That is my knowledge of them at least. I have a cabin on a small lake near Fremont,MI. I have these in my garage. Their eyes glow in certain lighting, and it makes my skin crawl. uggghhh. Had a family of these horrible ugly fast 8 legged creatures in my home last year. Had to say, that it was NO fun trying to get them out and gone! Out of all the spiders here in Mi, the wolf spider is by far the most disturbing one to me. Makes my skin crawl just thinking about it, ewwww. I live in Edmore MI and keep finding single holes in my yard so i decided to dig one up. I took a long weed slid it down the hole and then dug it up carefully. The hole was between 8 to 10 inched deep. in the bottom of the hole was a spider close to the size of a quarter. It look like a wolf spiders in some of the pictures above. Am i correct and have you seen that before. I dug up two last night. I just killed a very large black wolf spider in my garage (Ann Arbor) with poison. Once I am sure that the spider is dead, I'll spread it out and take a picture. A few years ago I encountered a spider hanging from a Maple tree near my home. It's abdomen was about the size of a small grape and it's legs were similar to the size and shape of bent toothpicks. It was hairless and completely orange in color. It had no markings of any kind -- just orange all over, including the legs. I have googled "orange spiders" a few times but with no luck. Does anyone know of such a spider? How can I send you a picture. My daughter found and took a picture of a large spider in her backyard. She is concerned for her two and three year old daughters. I believe it is a wolf spider. My e-mail is josephtc53@gmail.com thanks. Back when I lived with my parents, we lived in a house in Rochester Hills, my bedroom had a door that went outside, but there were gaps between the door and the frame. I had tons of different species of spiders in my room at any given time. I felt like I was in the movie Arachnophobia, it was somewhat scary at times, not going to lie, and they were nowhere else in the house, but my room. One day I was sitting at my computer and I seen something black on the floor out of the corner of my eye, so I looked down. There it was, the mother of all wolf spiders! It was the size of a mouse and that was just the body, the legs were even longer. I screamed bloody murder and called for my mom. I have never liked spiders, so my mom didn't think anything of it at first. She came into my room with a small tissue and I told her to look down underneath me. She looked and even she couldn't believe it. She has never been afraid of spiders, but that one kind of scared her, since it was so big. She ran and got some household cleaner and started to spray it. It tried to hide, but she finally got it to the point where it was dying, so she could grab it and throw it in the toilet. That was the most scariest spider I have ever seen and to this day, I have never seen another one no matter where I have lived. I live near the woods in Canton MI, close to Saline & Ann Arbor. I seen a very large spider, one I've never seen before so I snapped a pic of her, I say her only because I "Think" she was protecting her egg sac, she was resting on a ball of white something for quite awhile, so I'm assuming it's a "Her" & she was protecting her soon to be babies. I REALLY would love to know what she is, can I get an email so I can email u her pic, I left her alone after I took her pic, I'm not one to harm any living creature. My email is BFarhat80@gmail.com, Can I get an email so I can send u a pic of the believed to be female brown recluse spider please?